#iwill is a UK-wide campaign that aims to make social action part of life for as many 10 to 20 year-olds as possible by the year 2020. Step Up To Serve is the charity that coordinates the collective effort of the #iwill campaign by connecting campaign partners, communicating the stories and impact of quality social action and challenging partners to do more. 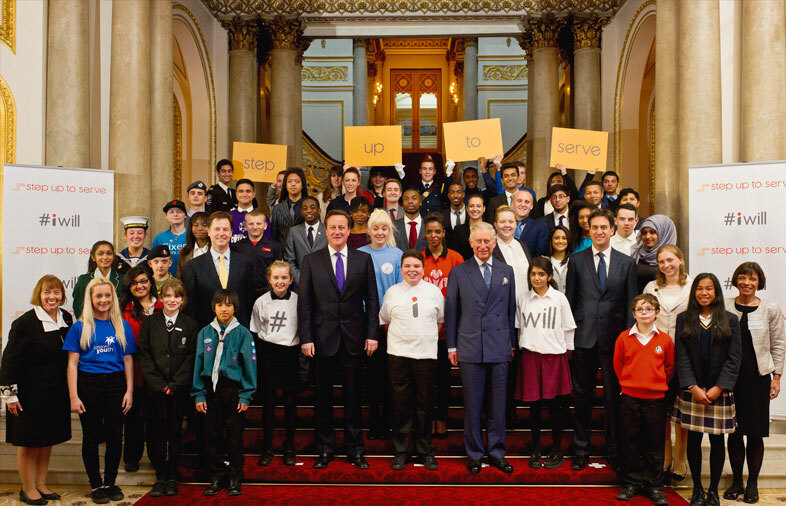 The Patron of Step Up To Serve and the #iwill campaign is HRH The Prince of Wales and it is governed by an independent board as well as having cross-party support. Ultimately, we want young people to have the chance to take part in meaningful social action – building a habit for life and further empowering them to be more active citizens today and in the future. The Labour Party also made specific reference to supporting #iwill in its’ pre-election manifesto. This support has since been retained with relevant Shadow Cabinet and back-bench MPs confirming their backing of the campaign objectives. When young people take part in social action, everyone benefits. They do – because they build their skills, character and wellbeing – and communities do – because they’re healthier, more integrated and socially mobile. This is what we call the ‘double benefit’ of meaningful social action and why we want more young people to take part in it. The campaign’s aim is to create the conditions in which quality youth social action can be embedded throughout the UK, focusing especially on increasing participation of young people from lower socioeconomic backgrounds and on sustainable solutions that can be scaled to reach more young people. 2013 – Patron of Step Up To Serve, HRH The Prince of Wales with party leaders and Step Up To Serve founders – Dame Julia Cleverdon (left) and Amanda Jordan OBE (right). In 2012, the Prime Minister asked Dame Julia Cleverdon and Amanda Jordan OBE to review how to increase the quality and quantity of youth social action. After a wide-ranging consultation their report highlighted the barriers to youth social action and produced a set of recommendations. Barriers included a shortage of activities in education from 10 upwards; confusion in the education and business sectors about the kind of initiatives they could support; failure to promote and inspire young people to take part; and an absence of a coherent vision to promote a culture of youth social action. The recommendations were to create an easy to navigate “service journey” for young people; scale up programmes to fill gaps in provision; embed social action in young people’s educational experience (school, further and higher education); develop a culture of promoting and celebrating youth social action comparable to effective programmes run in other countries around the world. The review, concluded that an initiative uniting organisations and the public should be set up to increase opportunities for young people. This initiative should be time limited, add to existing activity, and be a research and advocacy body, not one running programmes itself. This initiative is the #will campaign that is being coordinated by the charity Step Up To Serve.